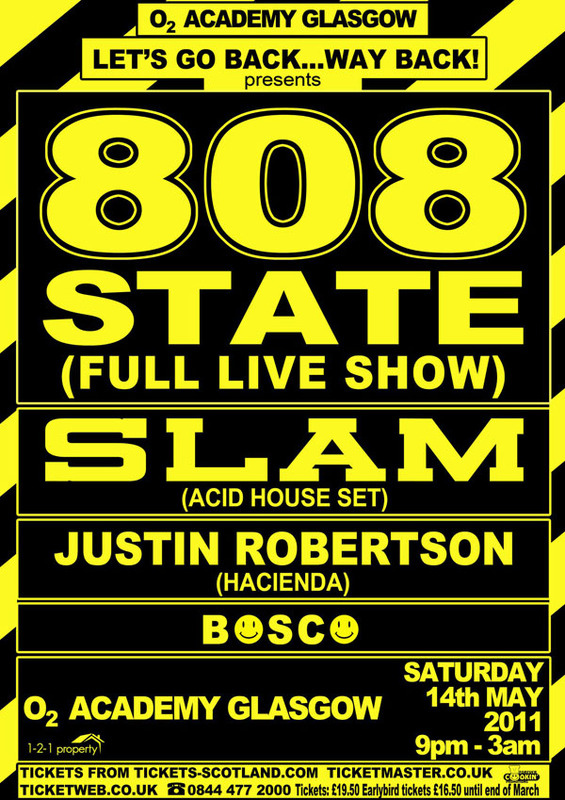 808 State DJs & 808 State Soundsystem = DJ sets by Andy and/or Darren (a.k.a. Spinmasters). Includes Biting Tongues, Toolshed, Sisters Of Transistors & Massonix (all Graham Massey). Always check locally with venue to confirm! For booking requests please see the contacts page. Sat:31:Dec:11 - DJ Darren Partington + MC Tunes - Antwerp Mansion - Manchester. Fri:23:Dec:11 - 808 State DJs - Cornerhouse - Middlesbrough. Sat:19:Nov:11 - 808 State DJs + MC Tunes - Antwerp Mansion - Manchester. Sun:30:Oct:11 - Sisters Of Transistors @ Halloween Music Fair - Camden, London. Sat:29:Oct:11 - 808 State DJs - Codice a barre club - Milan - Italy. 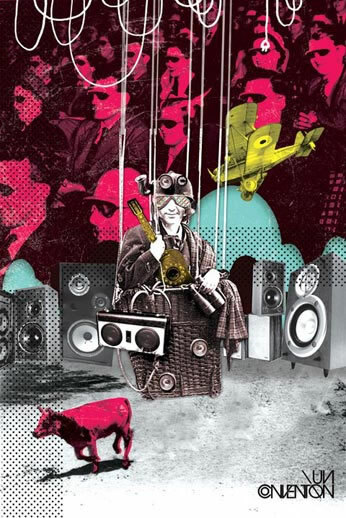 Sat:29:Oct:11 - Sisters Of Transistors @ Un-Peeled - The Continental - Preston. Sat:01:Oct:11 - 808 State DJs - Shine - Belfast. Fri:16:Sep:11 - 808 State DJs - Berghain Panorama Bar - Berlin - Germany. Sat:03:Sep:11 - 808 State Live - Metamorphose - Shizuoka - Japan. cancelled due to bad weather. Forum. Sat:03:Sep:11 - 808 State Live - Club Unit - Tokyo - Japan. Replacement of the above event. Forum. Fri:19:Aug:11 - Spinmasters (808 State DJs) - Old Skool's Most Wanted - Dry Live - Manchester. Sat:13:Aug:11 - 808 State DJs - SummerSonic - Osaka - Japan. Fri:12:Aug:11 - 808 State DJs - SonicMania - Tokyo - Japan. Thu:07:Jul:11 - MC Tunes film by Howard Walmsley @ Islington Mill - Salford - Manchester. Sat:02:Jul:11 - 808 State DJs - Big Beat Reunion @ Brixton Jamm - London. Sat:25:Jun:11 - DJ Graham Massey @ Future Perfect - Arts v Cancer festival - Castlefield Arena - Manchester. 24-26:Jun:11 - 808 State DJs - The Unfairground - Glastonbury Festival 2011 - Glastonbury. Fri:03Jun:11 - 808 State DJs - Stepping Out @ Mojo - Manchester. 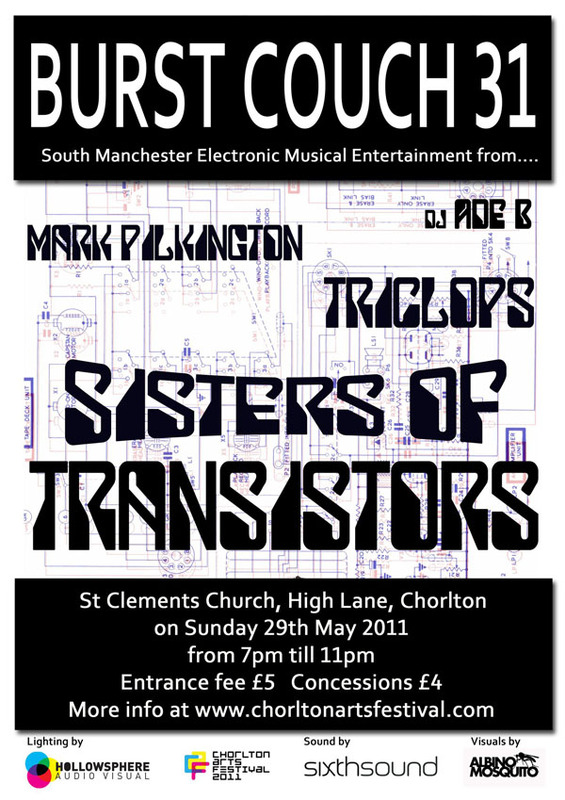 Sun:29:May:11 - Sisters Of Transistors - Burst Couch 31 - Chorlton Arts Festival - Chorlton - Manchester. Sat:14:May:11 - 808 State Live - O2 Academy - Glasgow - Scotland. Alternative flyer. 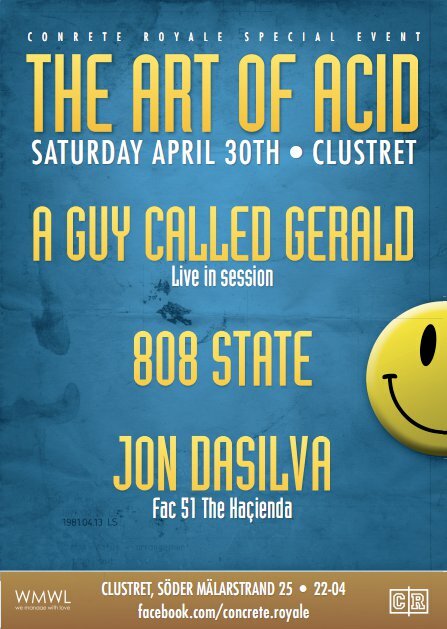 Sat:30:Apr:11 - 808 State DJs - Clustret - Stockholm - Sweden (+ A Guy Called Gerald). 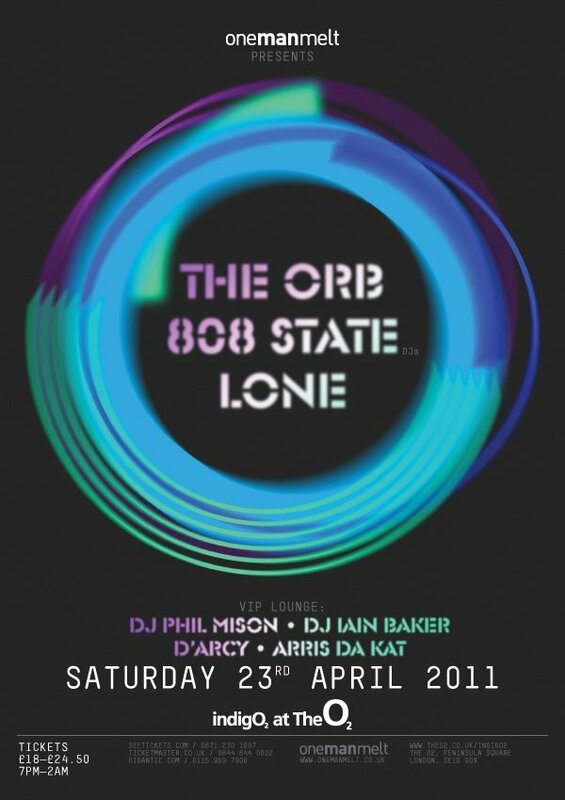 Sat:23:Apr:11 - 808 State DJs - IndigO2 - London (incl. The Orb). Fri:22:Apr:11 - 808 State DJs - From Manchester to Japan with Love x - Sankeys - Manchester. Wed:13:Apr:11 - 8:30 pm - MC Tunes film by Howard Walmsley - Green Room - Manchester. Thu:24:Mar:11 - 808 State DJs @ Ministry Of Found - Dray Walk Gallery - London. Wed:23:Mar:11 - 808 State DJs @ Land Of The Rising Funds - Mojo - Manchester. Fri:18:Mar:11 - 808 State DJs @ Stepping Out - Mojo - Manchester. Fri:04:Mar:11 - 808 State DJs @ Stereo - Deja Vu - Hull. Fri:25:Feb:11 - 808 State DJs - Voodoo - Helsinki - Finland. cancelled! Thu:13:Jan:11 - Graham Massey (panelist) - Un-Convention - Groningen - The Netherlands.